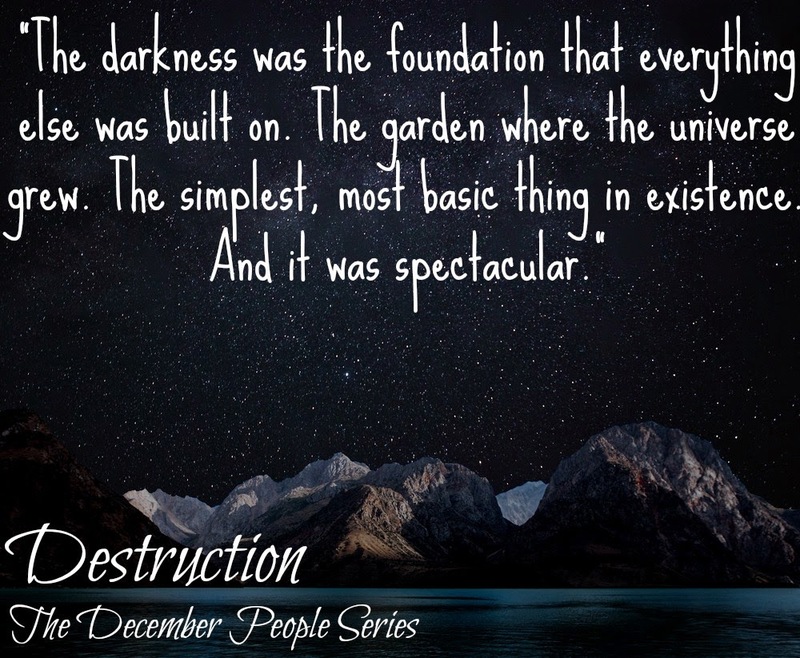 This winter solstice, enjoy a free excerpt from the dark wizard family drama Destruction. David and his family plus Samantha stood in a circle around a small pile of unlit firewood in the backyard. They stood arranged by age: David, Amanda, Jude, Patrick, Xavier, Samantha, Emmy, Evangeline, and then of course, David again, all twice as thick with jackets and scarves. The air felt hard with cold, a determined cold that seeped through all of David’s layers. They held candles—but no matches—in their gloved hands. The family had gone through the house, turning off lights. All of the lights. They even turned off the red lights glowing on electronics. They had unplugged the entire house. However, David could easily see. An orange haze of light peeked up from the trees. Millions of lights lit up the world all around them. Darkness didn’t exist in the middle of Houston. As soon as they had managed to arrange themselves into a circle, the kids got quiet without David or Amanda instructing them to. Wizards standing in a circle felt significant to David. When they got in that position, they snapped into place. The air became denser around him and he was rooted to the spot, as if with extra gravity. But he didn’t feel confined. He felt powerful. He plugged into an energy source he didn’t even know existed. His fingers had an itchy, tingly feeling. He knew he could do magic. The paper in Amanda’s hand crinkled loudly as she held it close to her face. She had done her research, which David found endearing and impressive. She had talked to Samantha and Evangeline and some of the witches Penelope’s mom knew and had created a ritual designed specifically for them, as the matriarch of the family should. Amanda had explained that he matriarch of the family always directed group spell casting, because she understood her family’s magic, the purpose of each family member, and knew how to keep them in balance—a tall order, since Amanda didn’t know much about some of the newest members of her family and knew even less about magic. But David had never known Amanda to say she couldn’t do anything, so why start now? Amanda owning this task shocked the kids, but not David. He knew her better than anyone did. Thus, he knew her mind and the rest of her often disagreed. Her left brain dug her feet into the ground and wouldn’t budge. That part of her would say things such as “We’re not practicing magic” and “We’re divorced” until kingdom come. She would say it. She’d believe it. And she’d do the opposite, because occasionally the parts of her not governed by her left brain would break free. David may not be able to sway the left-brain side of her, but he could influence her other side, and he thought that maybe he had actually convinced her of something, for once. And, part of Amanda had really wanted to be convinced, because wizards stayed wizards, no matter how many years they’d been indoctrinated otherwise. They listened to forces that had nothing to do with logic or reason, making them stupid, reckless, destructive, and exciting. And they liked to play with fire. Literally and figuratively. “You’re supposed to have it memorized,” Evangeline said. “No,” Amanda said. “It’s supposed to be me. My words.” Amanda let out a shivery sigh. “I’m sorry. I know I’m not supposed to do this.” She took her phone out of her pocket and turned it on. She illuminated her paper with the dim blue light. So, only in darkness can we truly see. So, only in darkness can we truly hear. So, only in darkness can we truly feel. And then, she fell silent. David couldn’t hear the cars on the highway anymore. He couldn’t hear the music playing down the street. He could hear only the breathing of the others in the circle. And the sky… the orange haze disappeared, and the sky reminded David of the one he had seen over Big Bend. Millions of stars set against a perfect pitch black. The moon cast a crisp, blue light upon them. With her words, or perhaps with some other magic deeper than words, she had called the darkness to them. David pictured it as a bubble around them. The quiet didn’t feel as awkward as David would have expected. No one giggled or even coughed or sighed. His lungs felt larger. He could breathe. This darkness didn’t feel frightening. In fact, David couldn’t remember ever feeling so safe. The darkness was the foundation that everything else was built on. The garden where the universe grew. The simplest, most basic thing in existence. And it was spectacular. “The solstice marks not only the height of darkness, but also the return of the sun.” Amanda read from a second sheet of paper. “The cycle of the seasons represents a promise from God. A promise that in darkness, light never truly falters. Although it appears dark here, the sun burns with all its glory on the other side of the Earth. With the change of the seasons, God reminds us that darkness always ends. Light always exists and will always return when missing. There is no night that doesn’t end. 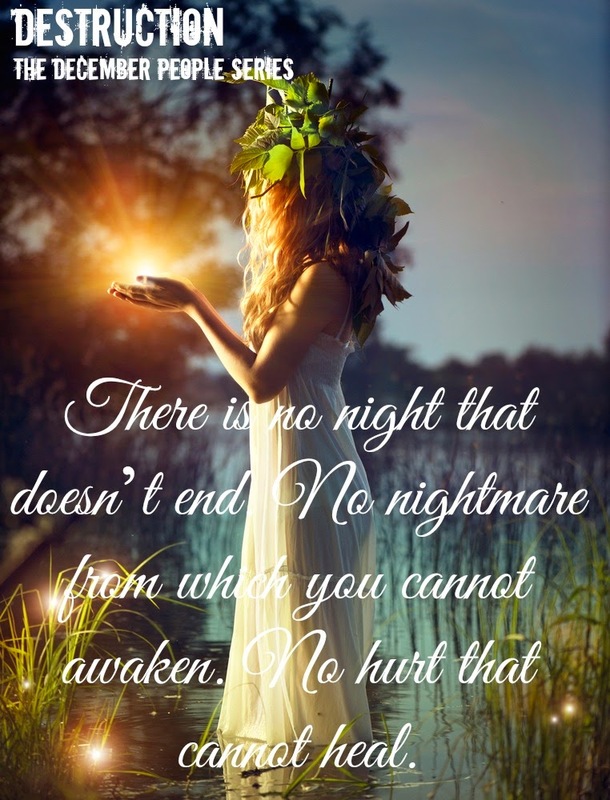 No nightmare from which you cannot awaken. No hurt that cannot heal. David’s heart rate picked up. Now he and the others would perform a spell. And not just any spell: a flashy, awesome spell. The first spell he would do on purpose since he had lost his memories. Earlier, he had doubted his ability and hadn’t succeeded in practice. But he hadn’t considered the magic the ritual would invoke. He felt confident now. He knew he could do it as easily as he knew he could clap his hands on command. Evangeline would go first. The youngest always did. 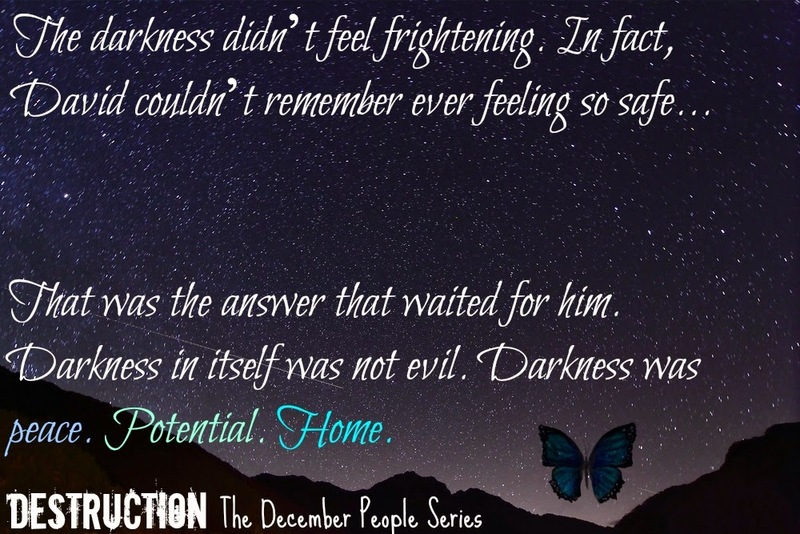 She pulled David’s oversized man’s gloves off her hands and stuffed them in her pockets. She held out her hand, palm facing up, and blew on her palm as if trying to ignite a fire. A puddle of emerald green light appeared in her hand, as if she opened a portal to another dimension. She dipped the wick of her candle into the light, and the candle burned with a green flame. He knew Evangeline could do it but couldn’t wait to see what his previously unmagical daughter could do. When he saw the look in Emmy’s eyes, he knew she could do it. Her reckless determination and confidence would make her a fantastic witch. From what David had learned so far, so much of spell casting was simply about truly wanting something and believing it could be. Sure enough, a ball of fire came from all the way down her arm and rolled off her fingertips, as if she pitched a softball. She tossed it in the air and then it rested in her hand. Way more fire than necessary to light a candle. She only had to hold the wick within close proximity of the flame to get it lit. Samantha did something similar to what he had caught her doing in Emmy’s room. Globs of bright white light oozed from her hand, like one of those lava lamps from the eighties. She touched the wick to one of the globs and instead of a true flame, a little ball of light perched on top of the candle. Xavier’s flame mesmerized David. The flame danced, alight with the full spectrum of colors, moved in unpredictable directions, and gave off iridescent sparks. They would no longer need to purchase fireworks for the Fourth of July. David could tell they all held their breath for Patrick. In that moment, they all wanted him to succeed. David thought their combined magical good wishes would have a powerful effect. Patrick had the face of an Olympian preparing for a race. Not nervous. Just focused. He narrowed his eyebrows at his palm. He glanced for a second at Samantha, and then turned back to his palm. His hand turned bright gold, as if King Midas had touched him. Patrick smiled broadly and held his hand in front of his face to inspect it. Then he touched one golden fingertip to the wick. It didn’t work at first, but then he shook his hand and a flame erupted from under his fingernail. Jude had something impressive up his sleeve. Without even needing a moment to prepare, he sent a golden rivulet out of his palm. It meandered upward like a quickly growing plant. That was exactly what it turned into. The sprout became thicker, grew higher, and branched off into a tree. When he finished, the tree looked as perfect as if sketched on paper, stood five feet above his hand, and flames flickered on the branches instead of leaves. Jude smiled with full teeth and dimples. He hadn’t smiled that way in a long time. Amanda had a deep red flame. It swayed hypnotically and turned David into a moth. He couldn’t keep his eyes off it and would have stuck his nose in it if Amanda hadn’t said his name. His heart beat faster. He felt the pressure of everyone’s eyes and everyone’s expectations. What would they think of him if he couldn’t do it? As the father, he should come up with something impressive and awe-inspiring. Something worthy of the head of household. He thought about Amanda’s original command, find and sow the light. So, first he had to find. He remembered how his fingers had felt itchy and tingly. He only had to recall the feeling for it to come back and spread up his hand and into his arm. It felt hot and cold at once and built steadily without him even trying. He knew what to do instinctively. He clenched his fist, which was the trigger. He shot a ball of flame out of his knuckles that climbed into the sky like a flare. Thank God he had aimed his arm upward. His light shot a good thirty feet into the air and then scattered in a rain of what reminded him of pixie dust. He looked at his unlit candle. He heard a scattering of giggles. David held his fist up again and positioned the candle above it. He tried pumping his fist more gently. The same thing happened, although he spanned only about ten feet this time. He tried to follow the light with his candle as a catcher would follow a fly ball, which resulted in even more giggles. Then, before he could ready himself, another fireball shot out of his fist unwillingly and went straight for Emmy. She dove to the ground and dodged it. She laughed so hard she couldn’t answer. “Why are you doing it like that?” Amanda asked. “Okay, try it again,” Amanda said. David followed his instruction and managed to get the orange orb of light to hover only about a foot over his hand. He carefully dipped the wick of the candle into the orb, and an orange flame stayed on the candle, while the rest of the orb sprinkled around him. This seemed dangerous to David. He didn’t like them throwing random unknown chemicals together to see what might happen. Starting with Evangeline again, they each used their candle to light a part of the campfire. The result prompted many ooos and aaas. The fire twisted and spat in a swirl of colors that reminded David of the Tasmanian devil. David placed his hand on the jug of water, but the fire relaxed into a more normal, yet multicolored fire that swayed unpredictably but stayed in its ring. “Do you think we can cook marshmallows on it?” Patrick asked. “Just to be safe, let’s not cook food with the magic fire,” David said.